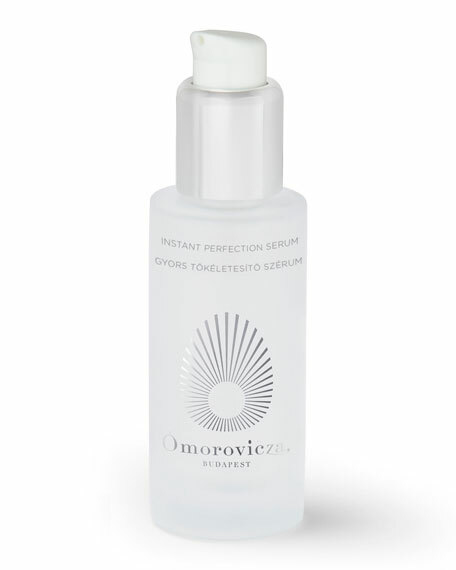 Omorovicza Instant Perfection Serum, 1.0 oz. This oil-free serum instantly awakens and smoothes the skin. Wrinkles seem to vanish as a more luminous complexion is revealed. It also provides the hydration required throughout the day. Rhamnose polysaccharide prevents harmful bacteria from accumulating on the skin's surface, preventing environmental stress caused by pollution and UV. Xylitol derivatives nourish dehydrated skin by facilitating the intercellular transfer of water. Hyaluronic acid plumps and hydrates the skin.